Slice tomatoes in quarters. Coarsely chop cucumber (if using different type of cucumber, peel first), red pepper and onion. Transfer all of the vegetables, to a food processor or blender and puree. Add garlic, vinegar and salt. Blend until smooth. With the machine on low, gradually add the of olive oil. Refrigerate until chilled. 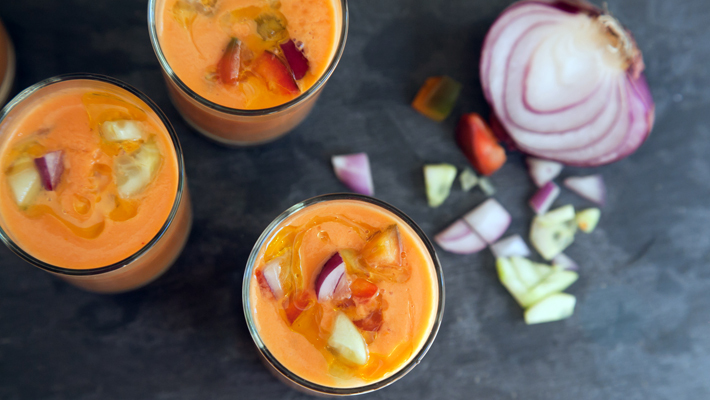 Ladle the gazpacho into bowls, drizzle with olive oil before serving.